The Panic of 1837 was one of the worst financial recessions in the history of the United States. Its roots lay in the administration of President Andrew Jackson from 1829 to 1837. Its effects were exacerbated under his successor, Martin Van Buren, from 1837 to 1841. The recession itself did not really end until 1843 during the administration of John Tyler, who succeeded to the presidency when in 1841 William Henry Harrison died shortly after his inauguration. President Jackson did several things that helped bring on the Panic of 1837. First, Jackson systematically and effectively destroyed the Second Bank of the United States. In 1832, President Jackson vetoed the bank’s early recharter which had been pushed by the bank’s supporters. Then, in 1833, he systematically removed the government’s deposits from the bank and placed them in “pet banks” of the administration. By the beginning of 1835, its charter having expired, the Second Bank of the United States was dead. With its demise also died the bank’s ability to mitigate credit crunches across the country. The federal government’s “pet banks” went on a lending spree. The actions taken by the Jackson administration had fueled land speculation – which the administration then crushed in 1836 when Jackson issued the Specie Circular and shifted the federal government’s surplus back to states in a way that severely overburdened the banking system. Particularly hurt were New York banks, which were forced to suspend payments in specie in May 1837. Jackson certainly had his own philosophical framework for these actions, but as historian Roger G. Kennedy noted, the nation’s seventh president “was moved throughout his career as often by wrath as by deliberation…”1 His vendetta against the Second Bank of the United States had led to economic catastrophe for states like Illinois, where Jackson had long been popular. While the Second Bank of the United States had been crushed, less reliable banks had popped up everywhere. Historian Jenny B. Wahl wrote that “the number of commercial banks exploded, from 220 in 1830 to 506 in 1834 and 729 in 1837. Chartering banks, taxing banks, and investing in banks were ways for states to build in financial and budgetary flexibility when they could not issue their own money.” 3 Historian Daniel Walker Howe wrote of the pet bank scheme: “Jackson had always regarded it an ‘experiment.’ Although Treasury Secretary Woodbury had dutifully regulated the pets, an administration committed as a general principle against federal regulation and planning did not find the task congenial. When the pets along with other banks suspended specie payment for a year starting in May 1837, hard-money Democrats complained that the public trust had been betrayed. It was time to rethink the government’s relationship with banking. Illinois historian Theodore Pease wrote that “by 1836, the issues of state bank notes, no longer controlled by the United States Bank and encouraged by the deposits of government funds, were reaching startling figures – more startling still was their apparent tendency not to find a place in the commercial business of the country, but instead to be used for purchases of the public lands. Credit by means of bank notes had been expanded far beyond the needs of the legitimate transactions of business, simply because these fruits of overexpansion could be used to procure public lands. To save the public lands of the nation from passing into the hands of speculators Jackson issued the much criticized specie circular, forbidding the reception of anything but specie and notes of specie paying banks, immediately in the case of large purchases and in the near future in the case of small ones.” 9 Jackson’s actions exposed the vulnerabilities of the national economy without a national bank to moderate credit crunches. Banks were dependent on the availability of specie to redeem their obligations. But there was not enough specie held by banks to handle their obligations. 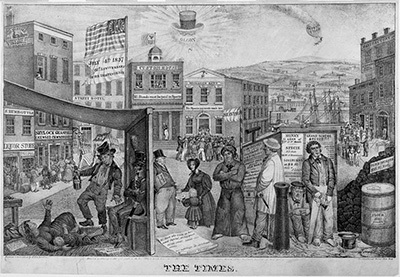 This was the political environment in which Abraham Lincoln had first unsuccessfully sought election to Illinois State Legislature in 1832 (when the veto controversy was brewing), first been elected to the State Legislature in 1834 (when the Bank War was at its height) and had been reelected in 1836 (when land speculation and pressure for spectacular state internal improvements were at their height). An admirer of Tennessee’s Jackson while a teenager in Indiana, Lincoln had become as a young a supporter of Kentucky’s Henry Clay, known for his “American System” of a national bank, internal improvements and a strong tariff. In early 1837, Lincoln supported a program for a vast internal improvements network in Illinois – just before the Panic of 1837 hit the state. Paul Studenski and Herman Edward Krooss argued: “The specie circular immediately stopped further credit expansion and brought the land boom to an end, precipitating a panic. However, Jackson’s action was not fundamental. The great overinvestment in state-financed capital projects and the overspeculation in land during the period of prosperity were much more responsible for the eventual collapse. Over-expansion was fed by capital imports from abroad, by vast expansion of bank credit, and by the government’s fiscal and banking policies. The rapid repayment of the national debt provided funds which the states borrowed….The land policy encouraged speculation. The failure to recharter the Bank removed the only control over the credit structure. While deposited in the state banks, the surplus acted as a source for credit inflation, and when distributed among the states, it added to the investment boom.”12 Then, the rickety financial structure that Jackson had created fell apart. During the summer of 1837, Van Buren struggled to come up with a program to deal with the crisis. Historian Ted Widmer wrote: “When Congress reassembled, Van Buren was ready. As usual, he had a little something for everybody. His message, delivered on September 5, was an impressive document, clear and concise. For the hard-money people he offered to postpone the final distribution of the surplus and proposed that an independent Treasury be created for federal deposits – separate from the banks. This was a momentous step, one that had been discussed in the most anti-bank fringes of the Democracy, but never put into motion.” 22 With Jackson’s blessing, Van Buren summoned a special session of Congress in September 1837 and asked for legislation to authorize removing the taxpayers’ money from all banks, placing it in an Independent Treasury. (The term was used to signify not only independence from banks but also independence from British capital, which had invested heavily in the old BUS.) Each major city would have a Sub-Treasury for local convenience. In the meantime, Van Buren removed the government’s deposit from the pet banks by executive action on the grounds that they did not pay specie as required by law.” 23 Congress passed everything but the independent Treasury scheme, which became a centerpiece of national politics for the next four years. Land sales were at the heart of the American crisis. The sales of public lands – and the resulting revenue to the U.S. Treasury – had skyrocketed in the mid-1830s. Historian Edward M Shepard noted: “The price of public lands was fixed by law at $1.25 an acre; and they were open to any purchaser, without the wholesome limits of area and the restraint to actual settlers which were afterward established. Here then was a commodity whose price to wholesale purchasers did not rise, and the very commodity by which so many fortunes had been made. In public lands, therefore, the fury of money-getting, the boastful confidence in the future of the country, reached their climax….In his messages of 1829 and 1830 Jackson not unreasonably treated the moderate increase in the sales as a proof of increasing prosperity. In 1831 his congratulations were hushed; but in 1835 he again fancied, even in the abnormal sales of that year, only an ampler proof of ampler prosperity. In 1836 he at last saw that tremendous speculation was the true significance of the enormous increase. Prices of course went up. Everybody thought himself richer and his labor worth more.”31 Illinois was not immune to such speculation. In Illinois there had been a major runup in real estate prices fueled by corrupt deals between eastern land speculators and western land agents for the federal government. This speculation was not just a rural phenomenon. In his History of Illinois, Thomas Ford, who lived through this period as an Illinois politician and governor, wrote: “In the spring and summer of 1836 the great land and town lot speculation of those times had fairly reached and spread over Illinois. It commenced in this State first at Chicago, and was the means of building up that place in a year or two from a village of a few houses to a city of several thousand inhabitants. The story of the sudden fortunes made there excited at first wonder and amazement, next a gambling spirit of adventure, and lastly an all-absorbing desire for sudden and splendid wealth. Chicago had been for some time only one great town market. The plats of towns for a hundred miles around were carried there to be disposed of at auction. The eastern people had caught the mania. Every vessel coming west was loaded with them, their money and means, bound for Chicago, the great fair land of fortunes. But as enough did not come to satisfy the insatiable greediness of the Chicago sharpers and speculators they frequently consigned their wares to eastern markets. Thus, a vessel would be freighted with land and town lots for the New York and Boston markets at less cost than a barrel of flour. In fact, lands and town lots were the staple of the country, and were the only articles of export.” 33 As a surveyor in central Illinois during the 1834-1836 period, Abraham Lincoln was a beneficiary of the land boom that caused an increased demand for his services as new towns were laid out. The self-taught Abraham Lincoln understood the credit needs of government agencies, businesses and farmers. He also understood the way that the nexus of land sales and banks corrupted politics. In 1836, Lincoln’s friend and fellow legislator, attorney John Todd Stuart, challenged incumbent Congressman William May for the sprawling northern congressional district. The Sangamo Journal, the local Whig paper with which Lincoln became increasingly associated, also challenged May, according to Lincoln scholar Andy Van Meter, who wrote that “the Journal let loose with both barrels, accusing May of profiting in land speculations by borrowing money from the administration’s ‘pet’ banks and purchasing land that the original settlers had lost because of errors in their titles.”35 Stuart who had been Lincoln’s legal mentor, lost the race, but he did not lose his congressional ambitions. The economic crisis had put the state’s normally Democratic politics into flux in 1837. Illinois Democratic Congressman May, representing the northern half of Illinois, became an apostate on Van Buren economic policy. May was challenged and defeated at a Democratic convention in November 1837 by youthful attorney Stephen A. Douglas, who in turn would be upset in 1838 by Whig Stuart in a close-fought contest during which Lincoln probably debated Douglas at least once. For Illinois, the Panic of 1837 began to hit home that summer. Historian Michael Burlingame wrote: “In July 1837…Governor Joseph Duncan summoned the legislature to Vandalia for a special session to address the consequences of the financial panic that had struck that spring, drying up the market for Illinois bonds. The state bank was in danger of losing its charter, a development that, in turn, might delay construction of the Illinois and Michigan Canal. In response to this crisis, Duncan recommended that the legislature scrap the internal improvement scheme it had passed earlier that year.”37 Illinois historian Charles Manfred Thompson, wrote: “There was a short extra session of the General Assembly in July, 1837, called by the governor to consider the difficulties that the state was having to meet its financial obligations. The panic of that year gave Governor Duncan an opportunity to express his opinion of the financial policy of the national administration, which he did in no uncertain terms. ‘At the time the President of the United States assumed the responsibility of ordering the public money to be removed from their legal deposit in the Bank of the United States, for the purpose, as he avowed, of preventing the re-charter of that institution by Congress, there never was a sounder currency, or a more healthy state of things in any government in the world.’ After showing the inadvisability of establishing the state banks, the governor went on to say, ‘Before the public were aware of the ruin which this wild scheme portended, the Executive and a portion of his party seeing their error it would seem, endeavored to escape the consequence by amusing the people with the absurd and impractical project of an exclusive hard money currency….There must be change, there must be reform. The Public Treasury must be again firmly placed in the custody of law; and all power and control must be repudiated…The patronage of the Executive must be reduced, and his power to remove public officers so modified as to prevent his displacing a faithful and competent man, either to gratify party malice, or to intimidate him in the free and independent exercise of the election franchise…That control over the public press, and Congress which has been so powerfully exercised by the appointment of newspaper editors, and members of the Senate and House of Representatives to high and lucrative offices by the executive, should as far as possible be obviated.’ This utterance reflected the attitude of the Whigs in general and the late anti-Van Buren Democrats in particular. They had no quarrel with Jackson, but they refused to support Van Buren or to approve the acts of the president, which they considered to have been inspired by unscrupulous advisers. The Democrats on their side took the opposite view. They endorsed in toto the policies of both Jackson and Van Buren, and the endorsement of the latter made a cleavage that unmistakably divided the Whigs from the Democrats.” 38 The state legislature did not act, but the politicians continued to seek political advantage. The Panic of 1837 led to a national reduction in the money supply. That led to further economic contraction and financial calamity for states like Illinois that had embarked on ambitious public works like the ones that State Representatives Lincoln and Stephen A. Douglas promoted in the 1837 session of the state legislature. As promising young politicians, they became spokesmen on economic issues for their respective parties – with Lincoln attacking and Douglas defending the Van Buren administration. As a Van Buren appointee as federal land register in Springfield, Douglas was at the center of the land speculation that gripped the country in the mid-1830s. There was money to be made in the sale of federal lands. Democrats were in a position to pocket some of it for a favored few. Lincoln wanted most of it used for internal improvements that would benefit all. Although the economy appeared to recover in 1838, so did speculation. Another economic blow hit in 1839. According to historian Edward M. Shepard: “In the early fall the Bank of the United States agreed to loan Pennsylvania $2,000,000; and for the loan obtained the privilege of issuing $5 notes, having before been restricted to notes of $20 and upward. ‘Thus has the Van Buren State of Pennsylvania,’ it was boasted, ‘enabled the banks to overcome the reckless system of a Van Buren national administration.’ The price of cotton, which had risen to 16 cents a pound, fell in the summer of 1839, and in 1840 touched as low a point as 5 cents. In the Northwest many banks had not yet resumed since 1837. To avoid execution sales it was said that two hundred plantations had been abandoned and their slaves taken to Texas. The sheriff, instead of the ancient return, nulla bona, was said, in the grim sport of the frontier, to indorse on the fruitless writs “G. T.,” meaning “Gone to Texas.”49 The economy would stay in the doldrums until 1843. Other Whigs recognized the importance of Lincoln’s arguments. According to Michael Burlingame, “Lincoln gave such a powerful address that it became the Illinois Whig Party’s textbook for 1840.” 81 Lincoln scholar Douglas L. Wilson noted that “To judge from its reception, the speech was considered extremely effective. Lincoln’s arguments were hard-hitting and tightly targeted, using the close reasoning that became his trademark. Although the body of his speech was crafted in disciplined prose, he allowed himself a florid and expansive peroration that outdid the rhetoric even of the Lyceum address: ‘If ever I feel the soul within me elevate and expand to those dimensions not wholly unworthy of its Almighty Architect, it is when I contemplate the cause of my country, deserted by all the world beside, and I standing up boldly and alone and hurling defiance at her victorious oppressors. Here, without contemplating consequences, before High Heaven, and in the face of the world, I swear eternal fidelity to the just cause, as I deem it, of the land of my life, my liberty and my love. '” The election year of 1840 was “pivotal” for Lincoln, noted Wilson. “At the outset he was still, as his law student, Milton Hay, put it, ‘outranked’ by such men as Stuart, Logan, John J. Hardin, Edward D. Baker, and Orville H. Browning.” But given his rhetorical efforts expounding Whig economic positions in the Harrison campaign, Lincoln came “to prominence by this time as a stump speaker.” 82 Lincoln’s mastery of history and economics were paying off. The erudition of his speeches belied the paucity of his formal education. The state bank’s existence depended on the continuation of the special session. Adjournment would mean dissolution. Democrats wanted the bank to expire and Whigs did not – so the Whigs tried to break the quorum in the House of Representatives in order to prolong the bank’s life. If the legislature could be extended until December 7, when the legislature was to begin its regular session, then the bank’s life would be extended until March when the regular session would end and so would the bank. Burlingame wrote: “The Whigs, hoping to have the regular session combined with the special session and thus postpone the bank’s day of reckoning, boycotted the legislature, thereby preventing the necessary two-thirds quorum for adjournment sine die. When the representatives gathered on December 5, the Whigs stayed away, except for Lincoln, Joseph Gillespie, and Asahel Gridley, who were to observe the proceedings and demand roll call votes.” 89 The Whigs miscalculated. By the time they realized there was a quorum present to adjourn, the quorum had already been ascertained by the sergeant at arms. Too late, Lincoln and two colleagues jumped out of the window of the church where the lower house was meeting.90 It was one of the most embarrassing incidents of Lincoln’s life and subjected him to embarrassing ridicule from Democrats. In 1842, bank issues came to a head in Illinois. Lincoln biographer Ronald C. White, Jr., wrote: “In the aftermath of the financial panic of 1837, Congress passed the Bankruptcy Act on February 1, 1842, the first such act in forty years. Logan and Lincoln pled more than seventy cases, representing both creditors and debtors but primarily arguing for relief for debtors, before the act was repealed thirteen months later.” White wrote: “Early in 1842, the State bank of Illinois had been forced to close. In August, the governor, treasurer, and auditor ordered county tax collectors not to accept the state’s own paper notes for payment of taxes and school debts. Only gold and silver would be accepted. Citizens, however, had almost no gold or silver.” 93 The specie and liquidity problems of the Panic of 1837 continued. Financial politics led to a dramatic and personal confrontation for now private citizen Lincoln. In August 1842, State Auditor James Shields issued the following communication regarding the ability of taxpayers to use paper money to pay their taxes: “The Governor, Auditor, and Treasurer have prohibited the reception of the bills of the State Bank of Illinois and branches in the payment of revenue of 1842, and of debts of the school fund….The object of this measure is to suspend the collection of the revenue for the current year, which would otherwise commence in September next, until the next Legislature may have an opportunity of acting on the subject….The restoration of a sound currency which is so essentially needed at present in this State can only be effected by the joint efforts of the Government and the people, and the first step toward the accomplishment of this object, is the rejection of depreciated paper by the State. It is folly to hope for a sound circulation while the Government is patronizing a worthless one. To prevent his change from operating oppressively the Legislature will have it in its power, by the reduction of salaries and the curtailment of all expenses not absolutely indispensable for the existence of Government, to make a material reduction in taxes for the next two years.” 94 Whigs took advantage of the unpopularity of Shields’ position to vilify him. A series of satirical letters appeared in the Sangamon Journal. One of these letters was written by Lincoln. Shields demanded an apology and retraction – supposing that Lincoln had also written another letter that was apparently co-authored by Mary Todd. A long series of negotiations followed that resulted in a challenge to a duel and a last minute negotiation that averted the scheduled event on September 22, 1842. It was one of the most embarrassing incidents in Lincoln’s life – and brought Lincoln’s association with state banking issues to a fitting close. Having cut their political teeth on the banking issues in the aftermath of the Panic of 1837, Lincoln, Douglas, Shields and Trumbull would all continue to rise in Illinois politics. Douglas, Shields, and Trumbull would all serve as United States senators. Lincoln twice would be defeated in his effort to win that same post, but he would twice be elected president of the United States – a position in which he would have to deal with an even more difficult set of economic problems. Roger G. Kennedy, Mr. Jefferson’s Lost Cause: Land, Farmers, Slavery, and the Louisiana Purchase, p. 166. H. W. Brands, Andrew Jackson: A Life and Times, p. 534. Paul Finkelman and Donald R. Kennon, editors, Congress and the Emergence of Sectionalism from the Missouri Compromise to the Age of Jackson, p. 195 (Jenny B. Wahl, “He Broke the Bank, but Did Andrew Jackson also Father the Fed?”). Ted Widmer, Martin Van Buren, p. 89. Arthur M. Schlesinger, Jr., The Age of Jackson, p. 224. Peter L. Rousseau, “Jacksonian Monetary Policy, Specie Flows and the Panic of 1837,” The Journal of Economic History, June 2002, p. 457. John Steele Gordon, An Empire of Wealth: The Epic History of American Economic Power, pp. 129-130. Paul Finkelman and Donald R. Kennon, editors, Congress and the Emergence of Sectionalism: from the Missouri Compromise to the Age of Jackson, p. 195 (Jenny B. Wahl, He Broke the Bank, But Did Andrew Jackson Father the Fed?”). Theodore Calvin Pease, The Frontier State, 1818-1848, p. 243. Bray Hammond, Banks and Politics in America: From the Revolution to the Civil War, p. 442. Paul Finkelman and Donald R. Kennon, editors, Congress and the Emergence of Sectionalism from the Missouri Compromise to the Age of Jackson, p. 137 (William W. Freehling, “Andrew Jackson, Great President (?)”). Paul Studenski and Herman Edward Krooss. Financial History of the United States, p. 110. Harry L. Watson, Andrew Jackson vs. Henry clay: Democracy and Development in Antebellum America, p. 79. Arthur M. Schlesinger, Jr., The Age of Jackson, p. 226. Sean Wilentz, The Rise of American Democracy, p. 456. Arthur M. Schlesinger, Jr., The Age of Jackson, pp. 218-219. John Steele Gordon, An Empire of Wealth: The Epic History of American Economic Power, p. 130. Ted Widmer, Martin Van Buren, p. 100. Edward M. Shepard, Life of Martin Van Buren, pp. 316-317. Wyman Boardman, America and the Jacksonian Era, 1825-1850, p. 29. Ted Widmer, Martin Van Buren, pp. 102-103. Daniel Walker Howe, What Hath God Wrought, pp. 506-507. John M. McFaul, The Politics of Jacksonian Finance, p. 191. Arthur M. Schlesinger, Jr., The Age of Jackson, pp. 239-240. Daniel Walker Howe, What Hath God Wrought, p. 502. John Steele Gordon, An Empire of Wealth: The Epic History of American Economic Power, p. 133. Donald B. Cole, The Presidency of Andrew Jackson, p. 235. Fred Kaplan, Lincoln: The Biography of a Writer, p. 92. Paul Finkelman and Donald R. Kennon, editors, Congress and the Emergence of Sectionalism from the Missouri Compromise to the Age of Jackson, p. 196 (Jenny B. Wahl, “He Broke the Bank, but Did Andrew Jackson also Father the Fed?”). Edward M. Shepard, Life of Martin Van Buren, p. 294. Bray Hammond, Banks and Politics in America: From the Revolution to the Civil War, p. 453. Rodney O. Davis, editor, Thomas Ford, A History of Illinois, p. 123. Ford served as governor of Illinois from 1842 to 1846. Jane Flaherty, The Revenue Imperative, pp. 52-53. Andy Van Meter, Always My Friend, p. 50. Theodore Calvin Pease, The Frontier State, 1818-1848, p. 244. Michael Burlingame, Abraham Lincoln: A Life, Volume I, p. 137. Charles Manfred Thompson, The Illinois Whigs Before 1846. pp. 58-59. Daniel Walker Howe, What Hath God Wrought, pp. 503-504. Theodore Calvin Pease, The Frontier State, 1818-1848, p. 236. Andy Van Meter, Always My Friend, p. 45. Michael Les Benedict, “Lincoln and Constitutional Politics,” Marquette Law Review, p.1336, Volume 93, No. 4, Summer 2010. Roy P. Basler, editor, Collected Works of Abraham Lincoln (CWAL), Volume I, pp. 62-64 (Speech in the Illinois Legislature Concerning the State Bank January 11, 1837). Paul Simon, Lincoln’s Preparation for Greatness, pp. 299-230. Frank Coburn, “Abraham Lincoln and the Right to Rise: Rewriting History,” Lincoln Herald, Fall 2007, p. 156. Paul Simon, Lincoln’s Preparation for Greatness, p. 113. Rodney O. Davis, editor, Thomas Ford, A History of Illinois, p. 118. A detailed and highly critical analysis of early banking in Illinois can be found in Ford’s history. Daniel Walker Howe, What Hath God Wrought, p. 505. Edward Morse Shepard, Life of Martin Van Buren, pp. 370-371. Michael Burlingame, Abraham Lincoln: A Life, Volume I, p. 143. Paul Simon, Lincoln’s Preparation for Greatness, p. 156. Albert Beveridge, Abraham Lincoln, Volume I, p. 242. Paul Simon, Lincoln’s Preparation for Greatness, p. 157. See Richard Lawrence Miller, Lincoln and His World, Prairie Politician 1834-1842, pp. 346-349. Albert Beveridge, Abraham Lincoln, Volume I, p. 256. Albert Beveridge, Abraham Lincoln, Volume I, p. 257. Richard Lawrence Miller, Lincoln and His World, Prairie Politician 1834-1842, p. 350 (Sangamo Journal, December 20, 1839). CWAL, Volume I, pp. 200-201 (Remarks in Illinois Legislature Concerning an Act to Modify the System of Internal Improvements, January 30, 1840). CWAL, Volume I, p. 159 (Letter from Abraham Lincoln to John Todd Stuart, December 23, 1839). CWAL, Volume I, p. 159 (Letter from Abraham Lincoln to John Todd Stuart, January 20, 1840). Paul Simon, Lincoln’s Preparation for Greatness, pp. 188-189. Paul Simon, Lincoln’s Preparation for Greatness, p. 191. George W. Smith, When Lincoln Came to Egypt, p. 51. Michael Burlingame, Abraham Lincoln: A Life, Volume I, p. 150. Fred Kaplan, Lincoln: The Biography of a Writer, p. 11. Bray Hammond, Banks and Politics in America: From the Revolution to the Civil War, p. 490. CWAL, Volume I, pp. 160-161 (Speech on the Sub-treasury, December , 1839). CWAL, Volume I, p. 163 (Speech on the Sub-treasury, December , 1839). CWAL, Volume I, pp. 163-64 (Speech on the Sub-Treasury, December , 1839). CWAL, Volume I, pp. 165-66. (Speech on the Sub-treasury, December , 1839). CWAL, Volume I, p. 170 (Speech on the Sub-treasury, December , 1839). Michael Burlingame, Abraham Lincoln: A Life, Volume I, pp. 151-152. Gabor Boritt, Lincoln and the Economics of the American Dream, p. 65. Gabor Boritt, Lincoln and the Economics of the American Dream, pp. 65-66. William Lee Miller, “He Will Be Good – But God Knows When,” Lincoln Lore, Fall 2003, pp. 7-8. Rufus Rockwell Wilson, editor, Intimate Memories of Lincoln, p. 20 (Joshua F. Speed). Paul Simon, Lincoln’s Preparation for Greatness, p. 192 (Quincy Whig, January 4, 1840). Richard Lawrence Miller, Lincoln and His World, Prairie Politician 1834-1842, p. 343-344 (Illinois State Register, February 8 and 14 1840). Paul Simon, Lincoln’s Preparation for Greatness, p. 192 (Illinois State Register, February 8, 1840). John M. Palmer, Bench and Bar of Illinois, Volume II, p. 752. Douglas L. Wilson, Honor’s Voice, pp. 200-201, 210. CWAL, Volume I, p. 502 (Speech in the U.S. House of Representatives on the Presidential Question, July 27, 1848). James Roger Sharp, American Politics in the Early Republic: The New Nation in Crisis, p. 62. Daniel Walker Howe, The Political Culture of American Whigs, p. 265. Daniel Walker Howe, What Hath God Wrought, p. 507. Charles Manfred Thompson, The Illinois Whigs before 1846, pp. 82-83. Michael Burlingame, Abraham Lincoln: A Life, Volume I, p. 162. Paul Simon, Lincoln’s Preparation for Greatness, pp. 223-231. Michael Burlingame, Abraham Lincoln: A Life, Volume I, p. 163. Michael Burlingame, Abraham Lincoln: A Life, Volume I, p. 165. Ronald C. White, Jr., A. Lincoln: A Biography, pp. 127, 113. Jason Silverman, “The Greatest Duel that Never Was: Abraham Lincoln, James Shields, and Political Lessons Learned,” The Lincoln Herald, Fall 2009, pp. 181-182 (Letter by James Shields, August 20, 1842). See also J. P. Sean Callan, Courage and Country: James Shields, More than Irish Luck, pp. 266-267. Robert W. Johannsen, Stephen A. Douglas, p. 115.